It was, in effect, a one-stop, high-volume shopping venue for some of the world’s most prolific cyber criminals. Called Darkode, this underground, password-protected, online forum was a meeting place for those interested in buying, selling, and trading malware, botnets, stolen personally identifiable information, credit card information, hacked server credentials, and other pieces of data and software that facilitated complex cyber crimes all over the globe. Unbeknownst to the operators of this invitation-only, English-speaking criminal forum, though, the FBI had infiltrated this communication platform at the highest levels and began collecting evidence and intelligence on Darkode members. And today, the Department of Justice and the FBI—with the assistance of our partners in 19 countries around the world—announced the results of Operation Shrouded Horizon, a multi-agency investigation into the Darkode forum. Among those results were charges, arrests, and searches involving 70 Darkodemembers and associates around the world; U.S. indictments against 12 individuals associated with the forum, including its administrator; the serving of several search warrants in the U.S.; and the Bureau’s seizure of Darkode’s domain and servers. The Darkode forum, which had between 250-300 members, operated very carefully—not just anyone could join. Ever fearful of compromise by law enforcement, Darkode administrators made sure prospective members were heavily vetted. What’s the significance of this case, believed to be the largest-ever coordinated law enforcement effort directed at an online cyber criminal forum? In addition to shutting down a major resource for cyber criminals, law enforcement infiltrated a closed criminal forum—no easy task—to obtain the intelligence and evidence needed to identity and prosecute these criminals. And this action paid off with a treasure trove of information that ultimately led to the dismantlement of the forum and law enforcement actions against dozens of its worst criminal members around the world. The case was led by the FBI’s Pittsburgh Field Office, with assistance from our offices in Washington, San Diego, and a number of others around the country. But it wouldn’t have happened without the support of Europol and other partners in 19 countries. And in addition to the FBI obtaining enough evidence for search warrants and indictments in the U.S., we shared information with our foreign partners to help them make their own cases against the Darkode perpetrators residing in their jurisdictions. 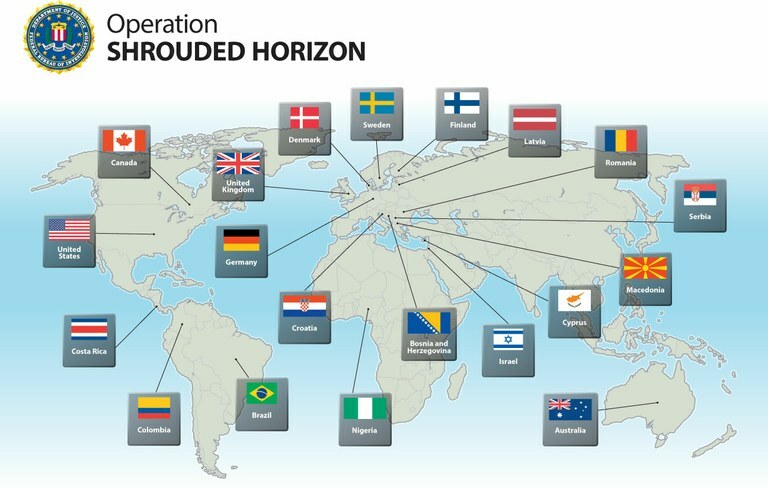 Operation Shrouded Horizon is a prime example of why the most effective way to combat cyber crime—which operates globally—is a law enforcement response that also transcends national borders.